I have talked about the Philips AirFryer in a few posts, namely here, here and here. Today I’d like to share a bit of a detailed review on this time-saver. Better yet, I shall share with you the interesting dishes I’ve cooked using the AirFryer. But before that, an image of my new love in the kitchen. It’s about the size of a big rice cooker, and it sits right next to my microwave without taking too much space. Better than having an portable oven! My oven is not getting much actions lately, poor thing. There are many things you can cook using the Philips Airfryer. I’ve covered some of the more interesting ones. The first recipe I cooked was a small batch of Fried Adobo Wings. And the next day, I followed up with a killer: Siew Yoke. 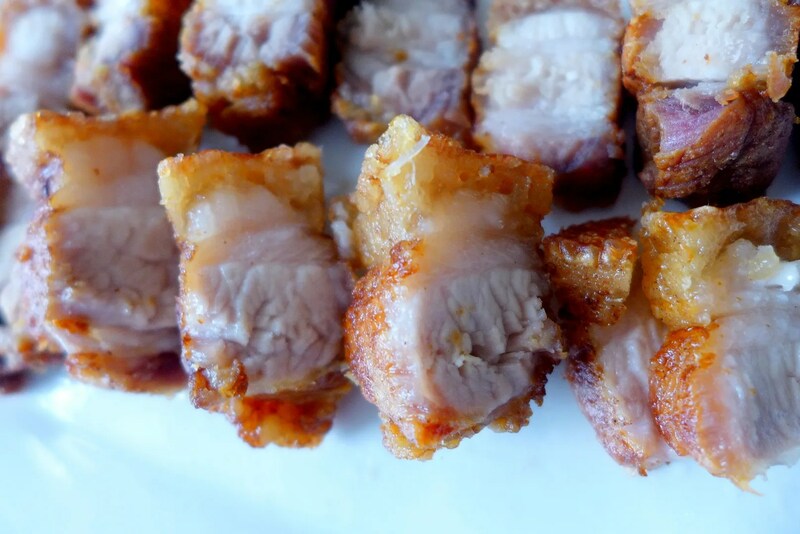 Perfect crackling on the Siew Yoke. The Siew Yoke was prepared the traditionally way with boiling, air-drying for few hours, then poking holes over all the skin. The marination is just salt, pepper, 5 spice powder, and I applied some lemon juice and salt mixture several times. 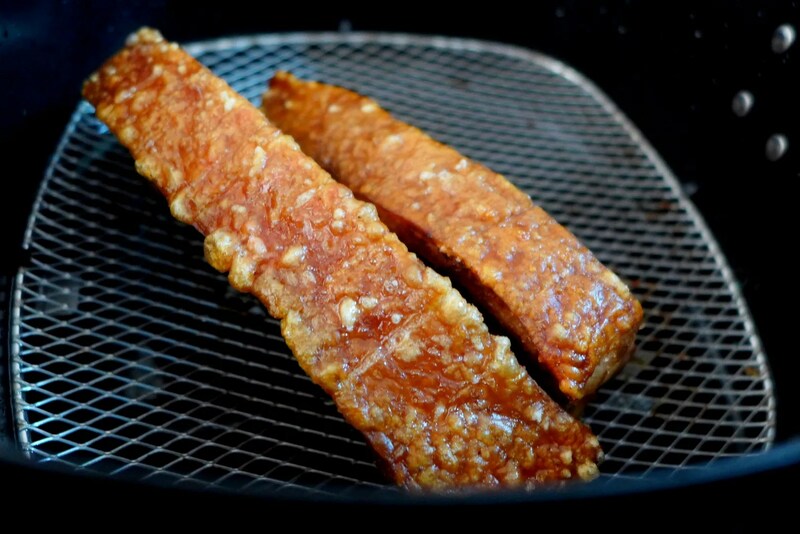 The skin is pat dry before air-frying for about 50 minutes. Absolutely thrilled with the results! 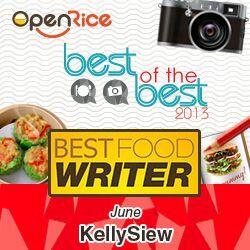 Now it’s much easier to fulfill my cravings for Siew Yoke. I prepared the Ratatouille separately. Spoon a generous portion into the ceramic dish, top with some almond meal, an egg, some cheese and generous sprinkling of chili and air-fried for about 10 minutes. 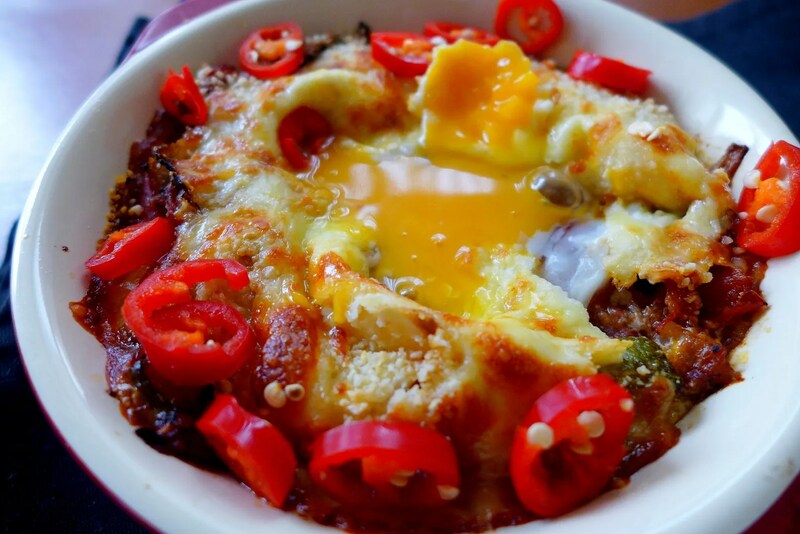 Runny yolk, melted cheese, perfection. 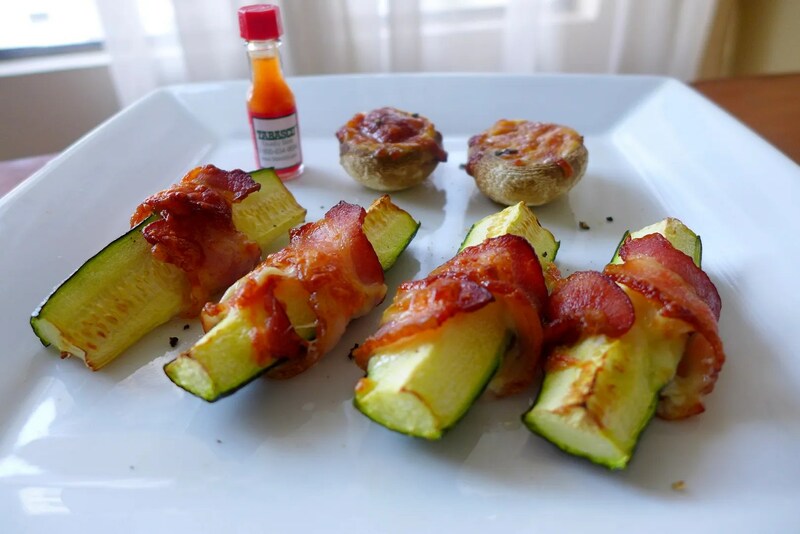 Bacon Wrapped Zucchini and Cheese Stuffed Mushrooms. Just putting a simple lunch together with these ingredients. It was fun! Of course, I wanted to do some more basic recipes such as homemade fries. This pleases the Irishman because it meant going out to get some potatoes (something that doesn’t happen anymore in this household). Perfect Crispy Fries. Definitely much healthier! With fries, you need to first cut the potatoes into desirable shape, soak in water for 30 minutes, pat dry, and then just airfry for about 30 minutes. I coated mine with a tablespoon of olive oil and some smoked paprika. Frank was happy with the results (I tried a couple, to be honest, and they were good). This is the special accessory you can get for the Airfryer separately. You can see that it has pierced surface which allows the Rapid air flow to cook the food evenly. 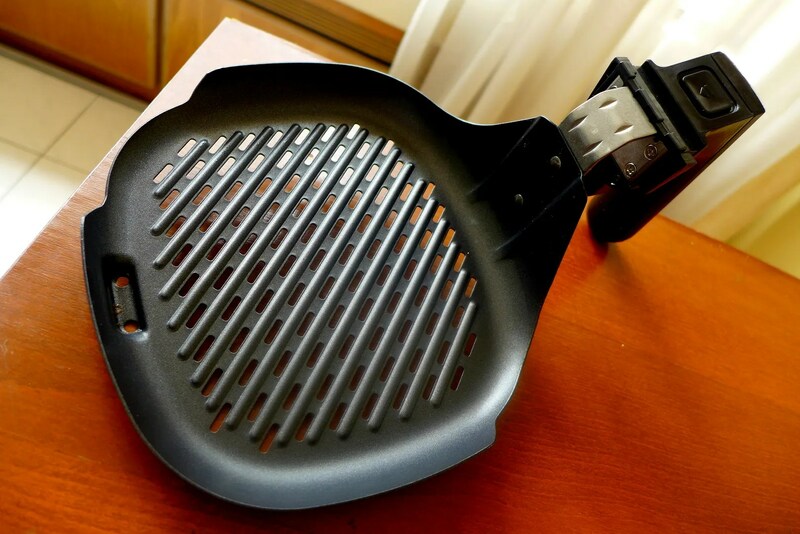 It is also non-stick, which allows for easy cleaning. This is perfect for grill fish, steak, and vegetables. For the next 2 dishes I used the Grill pan. That’s right, I was in a the mood for some fish dishes. 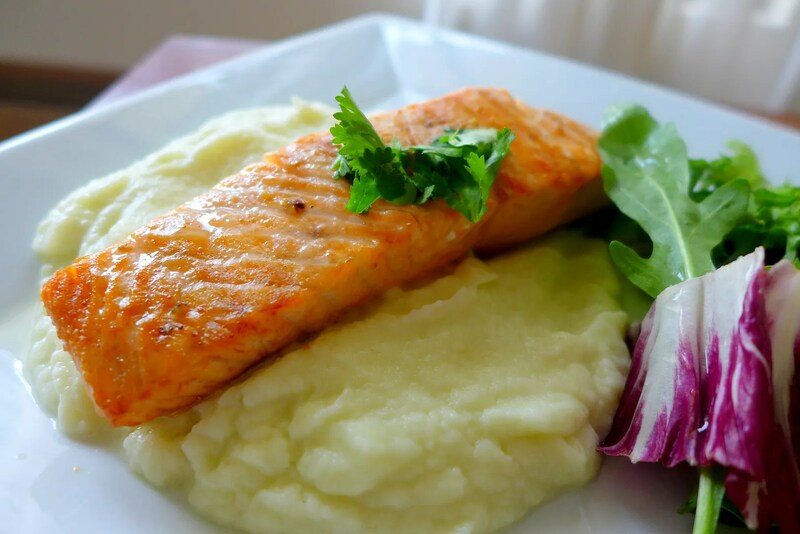 Air-grilled Salmon, with Cauliflower Puree. I must say I was impressed with how juicy the salmon was. I cooked this for 5 minutes, which means the inside was no longer raw, but still pretty succulent and tasty so I’m willing to look past the fact it was slightly overcooked for my liking. 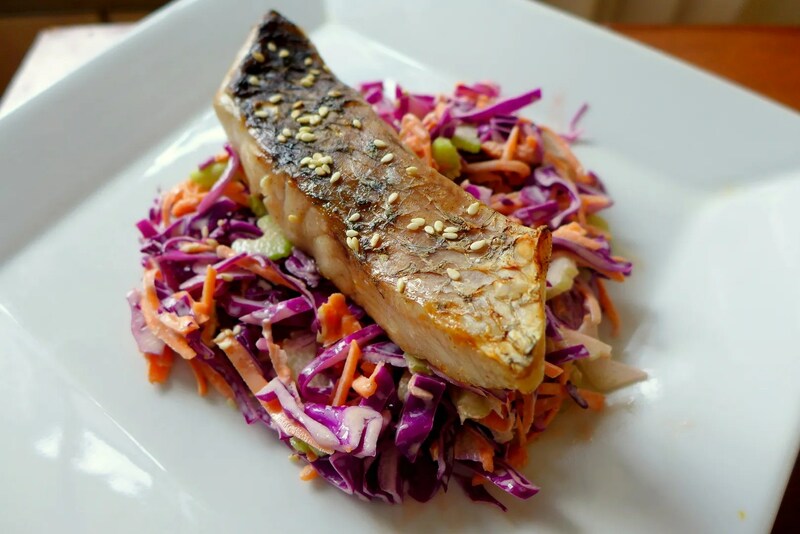 Air-grilled Barramundi on a bed of Coleslaw. Last but definitely not the least, a lovely piece of Barramundi. This one I had to cook for a little longer, about 10 minutes to make sure it’s definitely cooked through. Once again the fish retained it juices and this was a joy to eat! Think of it as a mini powerful oven, with precise temperature control. The rapid air circulating technology quickly heat up the food. And because it’s small, the temperature will stay constant even if you pull out the ‘drawer’ to check on the food. It has the ability to crisp up food just a deep fryer, just without the oil. So, no oil at all? Most of the time, yes. 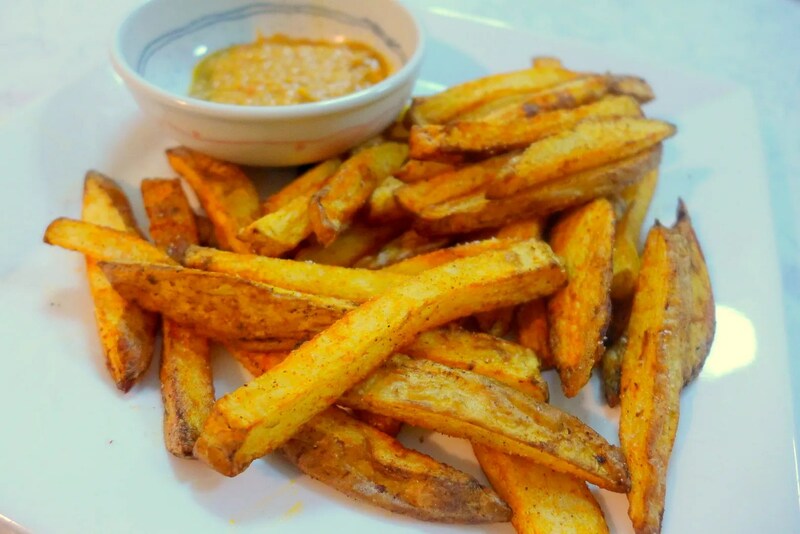 But if you were to cook something that’s breaded, or if you like to cook homemade fries, it’s recommended you use a tiny amount of oil (generally not more than one tablespoon) to help the process along. It’s fabulous for meat that already contains some fat, like chicken wings, salmon etc. How is it different than conventional oven then? First, it is much quicker to heat up, and it also cooks the food quicker too. A small batch of Chicken wings takes no more than 12 minutes to achieve perfect golden crust. It is optional, but if you do want to, preheating takes about 3 minutes. I often just left it on and go away to do something else until it beeps, then add the food. You only need the normal dish washing sponge to clean the basket. Sometimes when there’s stubborn remnants of food, just fill up with water until it covers the metal basket, and then airfry on 180C for 10 minutes. It will soften the stubborn bits. Feel free to send me some more questions so I can update the FAQs as needed. If you also own a Philips Airfryer and like to find out what else you can cook with it, do check out this group too Masak-Masak with Philips Airfryer and this facebook page: I love Philips Airfryer. Thank you! Airfryer has been very useful and saves a lot of time for me! Everybody’s talking about it on FB. Must be really good. Good enough for me to use it almost everyday! Can we use ceramic bowls inside? As long as it’s oven proof. Indeed, the possibilities are endless too. Love it! Where do you buy the grill pan for Philips Airfryer model hd9240 please. Hello, I have actually won my Philip airfryer along with the grill pan from a contest. I would say check your local hardware/department stores? Congratulations ! you’re so lucky! Hahha it was a cooking competition. Was fun! Depends on what ingredients you use, I don’t really bother reading too much into labels as long as I’m using good oil and good fat: in general natural oils are safer for example animal fat such as lard and butter, or coconut oil. Airfryer works like a small oven, so it doesn’t have the ability to actually change the fat so to speak. Hope that helps. Look every your foods cool so much. I also bought Philips air fryer 1 month ago. I love cooking, I love eating foods no oils and also know some local foods. These peppers sound fantastic and I’m intrigued by the airfryer. With one air fryer, I can easily and quickly cook every dish I like: all fried foods, food warehouses, including sauces. That’s great. I think you should have a Air fryer in your kitchen. I agree that Philips air fryer with Rapid Air Technology is the best out there. I love Philips too. Yes! It’s probably the most frequently used appliance in our household at the moment. 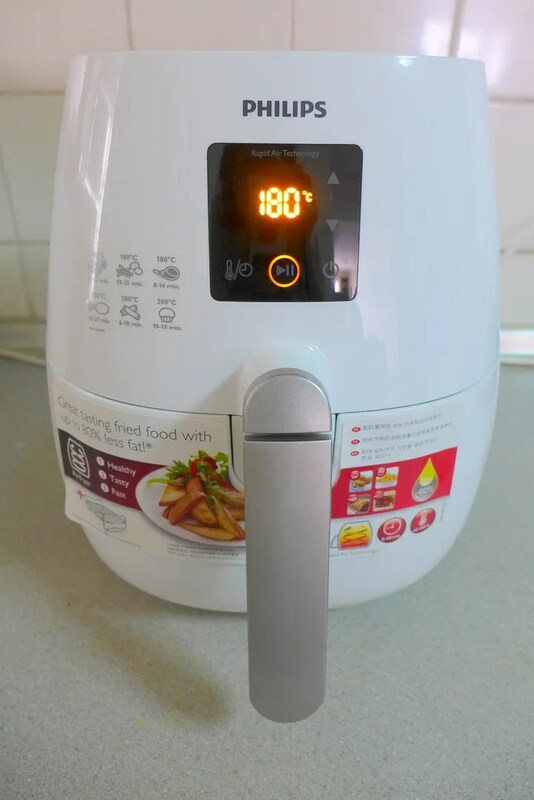 You have shared with us about air fryer and you have also shared many things about food on Philips AirFryer: A review.Thank you very very much for your nice post. I like the Airfryer a lot. DISADVANTAGE: coating begins to peel off eventually.